Arising from humble beginnings as a small fishing village, Pollença in Majorca is now a popular destination for visitors arriving from all over the globe. A large majority of the traditions that initially gave this coastal region its charm are still being practiced today. Visitors will delight in Pollença's relaxing promenades past the local cafés, as well as the pleasant air drifting in from the local countryside. The promenade begins along the Pine Walk path and progresses towards the luxury of the D'Or Hotel. The friendly and welcoming atmosphere of Pollença is set against the scenic landscape of the Tramuntana mountain range. Both families and couples tend to find this destination to be one that is full of adventure and romance, set in a location that moves at an elegant pace. The resorts and hotels offer a variety of packages for both short visits or long stays that are equipped for all types of visitors, from lone travellers to large groups. Pollença has a range of options, from all-inclusive family deals by international providers to local & independent villa rentals, complete with fantastic views of the stunning mountain range nearby. The type of accommodation experience is completely in your own hands. Take your pick! With over 100 cafés and restaurants in the area, visitors to Pollença will certainly not be disappointed by the amount of indulgences that are readily available. Although there are restaurants specializing in food from all around the world, the Mallorquin cooking is not to be missed out on whilst holidaying on the island. Simple, yet fresh and fascinating dishes can easily please the taste buds of even the sharpest food critic. Those with hearty appetites will also find comfort in the filling dishes that do their best to make the most of the traditional local produce. A great place to sample some of these local dishes is El Posito, a restaurant that is popular with both tourists and locals, and is well-known for its spectacular tapas and paella. As for those seafood enthusiasts, you are in luck; Pollença provides a variety of mouth-watering seafood hotspots at every turn. A must-try in Pollença is the La Llonja Restaurant, which is a traditional yet modern seafood restaurant, complete with top-quality fish caught fresh from the Meditteranean, plus stunning, picturesque views of just that. 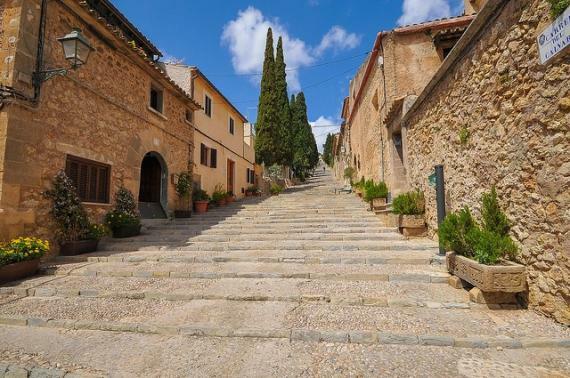 Visitors to this area will quickly find out that there are not enough hours in the day to see all the wonderful sites that Pollença has to offer. The Chapel of Calvari is a well-known & popular stop that gives travellers a glimpse at the traditional architecture that houses the faith of the local residents. The 365-step climb to the Chapel is well worth the effort for those individuals that can appreciate simple and meditative beauty. The Museum of Dionís Bennàssar effortlessly attracts the attention of art lovers that are visiting the region. Dedicated to a local artist born there in 1904, this building pays a tribute to Bennàssar's life and work. He rose through the ranks of society from a mere farmhand but lost the use of his preferred painting hand while fighting for the military in Morocco. Despite the injury, he continued to work until his death in 1967. Shopping in Pollença is also an experience that is unique for travellers. From crafts and locally grown foods to one-of-a-kind household items that are hand-crafted in a traditional style, there is something for everyone around every corner of the local markets. Those who would like to try their hands at cooking with fresh & local ingredients during an extended stay will find that the markets are the perfect place to purchase local delicacies. Artists and musicians have also found Pollença to be an extremely attractive destination for decades. It is home to many galleries, museums and concert halls that play host to famous & traditional works of art throughout the year. Find information about selected Hotels, apartments and rooms in Pollensa to choose the perfect place for your accommodation.